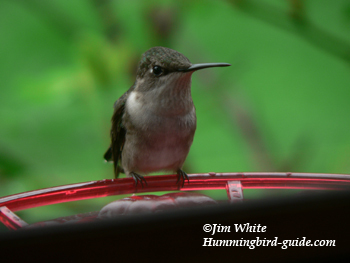 Hummingbird Photography.Tips for taking great hummingbird photos. Interested in getting into hummingbird photography? Anyone with a camera can take great hummingbird photos. As with all wildlife photography, it is important to know your subject. Here are some tips to taking great hummingbird photos. We now have a Photo Gallery with a collection of your photos from submissions and contests. If you would like to submit your hummingbird photos, hummingbird pictures, hummingbird images we would love to see them and include them in the gallery. Visit our photo submission page. I prefer taking pictures of my hummingbirds at my feeders. Some feeders are better than others for photographs. We like the tray feeders because they do not block the view of the bird. We also love the look of the artful decorative feeders. These feeders add to the beauty to the picture. Would you like to learn how to how to attract hummingbirds? Instead, you might prefer to look for them in parks and public gardens. You can get some lovely natural photos in these locations too. If you enjoy travel, then you can visit states like Arizona or Texas in order to see and photograph more species of hummingbirds. Hummingbirds habitat Texas, California and Arizona year round as well as other states. Become familiar with your subject. If you are a serious birder, traveling to South America can present opportunities to see and photograph beautiful hummingbird photographs some that might be endangered. What do they eat besides nectar, hummingbirds preen for insects (a spectacle to watch and photograph). What are their habits? 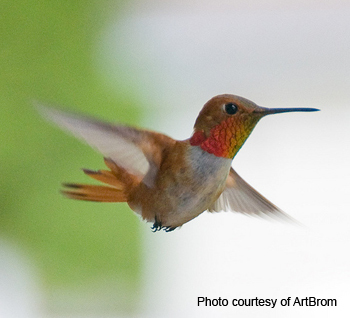 Knowing the facts about hummingbird behavior will help you to know how to get the best shots. Yes, in learning about the habits of the hummingbirds, you will soon realize that it will take a little patience to capture these beautiful birds in an image. Observe them in order to learn what time of day you are most likely to see them visit feeders of flowers. Ask yourself how these times correspond to favorable lighting opportunities for your photography. You can use any camera even a mobile phone camera to take a hummingbird picture. I have seen many gorgeous photos taken with simple cameras. However, the quality will vary depending on the equipment used. If you are serious about achieving professional results you need a Digital DSLR. 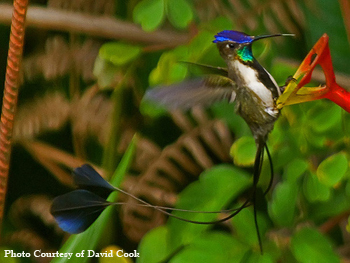 Even great cameras cannot freeze the fast wings of a hummingbird. They do not have shutter speeds fast enough for the wings of a bird that flaps 60 beats per second. You need to have several additional flashes on hand for that. Despite that, many of us enjoy the photographs that show the wing blur of our speedy birds. These photographs can look natural and don’t require the extra equipment. Remember that this is a creative effort and there is no right or wrong way to photograph a hummingbird. A Tripod is very helpful for great photos. Sometimes I will lean against a stationary object if available to steady my shot. Any excessive movement will blur your results. More professional results can also be obtained with a digiscope (a scope attached to a camera that allow for highly zoomed-in detailed close-ups. I personally love this. You can then capture every pretty feature of the bird. Jim and I love to use our Nature Cam. This is a camera that can take photos and videos without your presence. The benefits are obvious for photographing this quick flying bird. Our Ruby-throated hummingbirds are somewhat skittish of humans and scare away easily. Also, with the Nature Cam we can watch them in a more natural way. The night shots it takes are fascinating. The most important thing any beginner of hummingbird photography needs to know about lighting is keeping the light in back of you shining (if there is sun) on your subject the hummingbird. Here in this photo, I happened to get an ideal situation where the sun's position in the sky was shining only on the hummingbird. The feeder was blocked by a shadow, putting all the emphasis on the bird. A trick to consider is moving the feeder to an ideal location for the proper lighting. It may take a few minutes but the hummingbirds will make their visits. Hummingbirds don’t like a camera flash and it can be so disappointing when they fly away. (Believe me I know!) One trick that I have learned is to adjust the exposure to compensate for the different lighting situations found outdoors. Planning for hummingbird photography is optional but can be a good idea. We don’t always need to plan our shots. We have seen many wonderful spontaneous pics. Yet, we can gain some control with a small amount of planning. 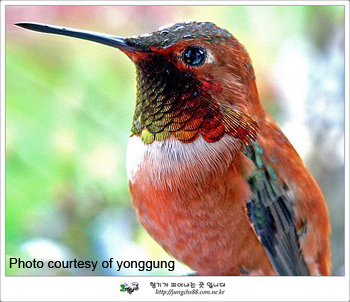 Do you love those gorgeous photos showcasing a beautiful hummingbird sipping nectar from a flower? Well, you really don’t need to wait patiently for that prefect shot. Hummingbirds will favor a feeder over a flower because its EASIER for them. 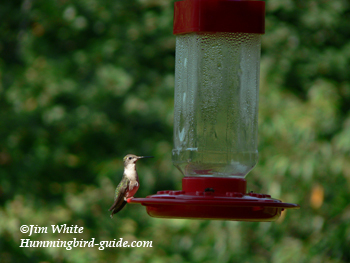 A trick I use is to remove the feeder that they are frequently visiting in a hummingbird flower garden. They will go to the flowers because its the only source available. The bird will appear as usual and you can get the picture. We have window feeders at our two kitchen windows. Previously, as soon as we open the window to take a picture, the hummingbird would fly away. Now we camouflage ourselves by cutting a piece of mat board or cardboard to fit the window. We then cut a hole for the lens in a spot that will enable us to see and photograph the bird. It’s that easy! This also works great for capturing videos on your camcorder. This photo was taken through one of our windows. Practice. Practice. Practice. It is so much fun photographing and the more you practice the better your photos will become. Don’t take one or two pictures and think you have failed. Professional photographers take thousands of photos of a subject before they consider themselves proficient. Today’s digital cameras allow all of this the luxury because we no longer need film. We can delete the ones we don’t want and keep the precious successes. We wish you good luck. Happy Hummingbird Photography! Unfortunately, not all hummingbirds are plentiful, there is a growing number of species which are threatened to extinction. 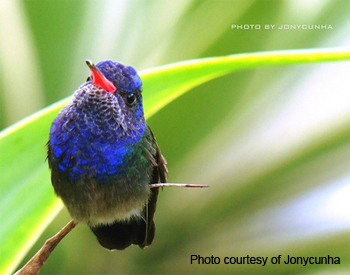 We have gathered some beautiful photos of endangered hummingbirds.